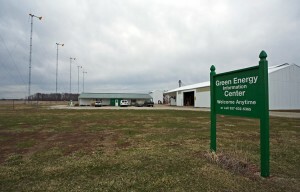 The Green Energy Center, located at the Dull Homestead near Brookville, Ohio, is a renewable energy center dedicated to public education and the advancement of sustainable energy and clean fuels. 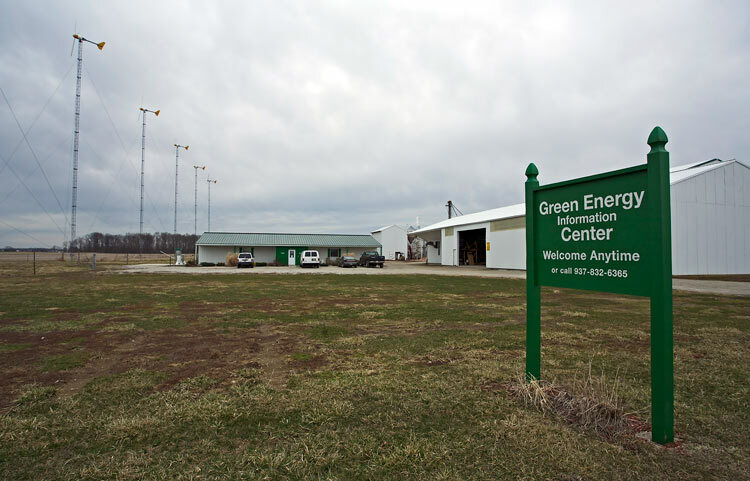 The center established in 2006, is one of a few worldwide that combines wind and solar, with hydrogen, to power and heat the facility. There is a 22 KW solar array located on the roof, six (10 KW) wind turbines, a 3.5 KW vertical axis wind turbine, and an AutoARK® 55 on site. MRE has also installed a SHFA (Scalable Hydrogen Fueling Appliance) that is supplied with hydrogen produced by the AutoARK® 55. The partnership between the Green Energy Center at Dull Homestead and Millennium Reign Energy has been an inspiring one. Together they have helped thousands of people become more aware of the benefits of renewable energy. In an ongoing effort to fuel their educational initiative the center provides space for other organizations and companies throughout Ohio. Representatives from Green Energy Ohio, Energy Wise Solar, Kevin Mote Fuels, Third Wind and many others display educational information on site. This material along side MRE’s AutoARK® generators, and each of the solar and wind components tell a compelling story. The future is here, come see it! A first hand experience of the potential for hydrogen from wind and solar.